Mel checks our speedboat engines are in good condition for the day! Home/News/Mel checks our speedboat engines are in good condition for the day! Mel is one of our full time PADI Open Water Scuba Instructors and also one of our boat captains! 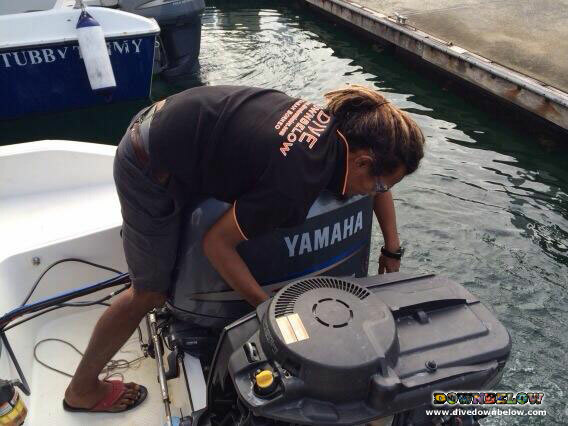 Our fleet of fast speedboats are essential to our dive operations, so of course Mel checks each engine with his vast knowledge and experience. This morning we have a few clients who are visiting our premier PADI 5 Star IDC Dive Centre on Gaya Island, to enjoy leisure diving within the protected area of Tunku Abdul Rahman Park! Our divers will enjoy 3 open water dives, each at different reefs within the marine park and at all times will be supervised by one of our professional dive guides of the island team. Contact one of our members of staff in our Head Office at KK Times Square to organise a daily dive package to suit your scuba diving holiday in Borneo! By Joanne Swann|2014-04-23T09:19:22+08:00March 23rd, 2014|News|Comments Off on Mel checks our speedboat engines are in good condition for the day!